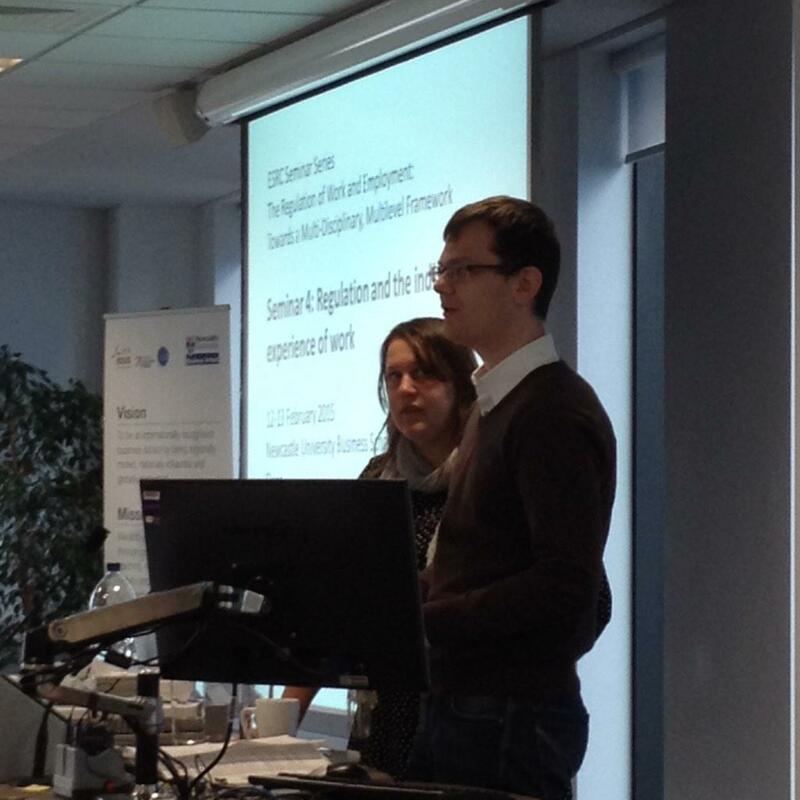 On the 12th and 13th February, Newcastle University Business School hosted the 4th seminar in the ESRC series ‘The Regulation of Work and Employment’. This two-day seminar covered regulation of professional identities, regulation of careers, self-regulation at work, regulation and intersectional inequalities, intersectional approaches to regulation and regulation and global workers. Andrew and I were rapporteurs for the first two sessions of day one, giving us a chance to reflect on key themes of the discussions, and consider how these issues related to our own research areas. The morning session involved discussions of individual experiences of work and regulation. The first presentation was delivered by Professor Carol Woodhams of Exeter University Business School. Carol’s presentation displayed a quantitative analysis of intersectional discrimination relating to pay in a large private sector company, and raised a number of interesting issues. Intersectional research is very rarely carried out using a quantitative approach; but, as Carol pointed out, quantitative methods can be useful to influence public policy and impact more widely ,as quantitative data is generally seen as ‘hard evidence’. In my own experience of working with trade unions, statistical data seems to have more impact than purely qualitative data. However, as a member of the audience noted, quantitative data which controls for issues such as level of seniority and working patterns risks masking structures and processes that exacerbate inequality in the workplace. For example, while it is eye-opening to see the disadvantage of simply being female, it is also important to consider how gendered role expectations and stereotyping may lead to unequal economic choices (such as part-time work and unpaid domestic labour). Carol also highlighted the multiplicative impact of intersectional discrimination, with the data strongly suggesting that while for most men, privileged characteristics can result in additive pay advantage (i.e. every privileged characteristic a man possesses adds to his pay packet), for women the negative impact of unprivileged characteristics creates multiplicative disadvantage, outweighing any advantage gained from privileged characteristics. Given the Coalition government’s decision to remove the provision for intersectional discrimination from the Equality Act, this raises serious concerns about the discrimination protections offered by current law. Finally, Carol raised questions about the business case for diversity, suggesting the true case is around cost – the more diverse the workforce the cheaper it is. This was a contentious statement amongst audience members, but it does offer food for thought – after all, we had just seen that even ‘best practice’ employers fail to pay their workers fairly…. The second presentation that day, by Professor Mark Smith of Grenoble Ecole de Management, considered how different groups of workers had experienced regulation. 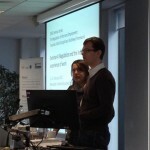 Focussing on two specifics groups of workers – child carers and interns – Mark showed that individual agency could operate within a regulated environment, but also highlighted that regulation had brought both positive and negative results, as well as unintended consequences. To get regulation right, we need to consider the impact on both sectoral groups and groups within specific sectors and organisations. Thinking about this in the context of my own research, the regulation of trade unions within workplaces – for example, the reductions in facility time for trade unions introduced by the Coalition government – will have a clear impact. If, as seems likely, it limits the ability of the most vulnerable groups of workers to gain (or maintain) a voice to protect and further the terms and conditions of their employment then this should be a serious concern for those who wish to promote the genuine business case for diversity. In the afternoon we had two fascinating presentations about regulation and migrant work – one by Olena Fedyuk from the University of Strathclyde, who was talking about Ukrainian migrants in Italy and Ireland and how their experiences in these countries were shaped by immigration policies. And then we had Sophie Gamwell from Middlesex University, who delivered outcomes of a research on recruitment of nurses from outside the UK, in particular talking about framework agreements and changes in recruitment practices it may entail. Both of them, although looking at drastically different population groups within dissimilar institutional and cultural context, emphasised some issues, which I believe, are familiar to everyone who has undertaken an attempt to study migrants work experience. And, being slightly egocentric, I cannot resist admitting that these matters resonate with my research project on career pathways of highly skilled migrants in the North-East and how their careers may be navigated by different factors, such us social networks. Within the context of migration, regulation appears as an issue of exceptional importance. Not just migrants’ employment, but even their very physical presence in the host country is a subject of regulation, not to say oppression. And whilst our discussion was revolving mainly around lower-skilled migrants, we should not assume that highly skilled ones are not affected by regulations. In fact, to some degree they be in even more vulnerable position, for highly skilled jobs are normally highly regulated, which entails numerous difficulties with recognition of foreign qualifications and experiences. Not surprisingly all our presenters were engaged to some extent with the issues of justice and equality. Yet, in migration studies we should be very cautious when operating with the term ‘discrimination’. Too many studies tend to ascribe all observed inequalities in labour market performance to discrimination, although there might be other factors that ought to be examined. And we should ask ourselves – what sort of discrimination are we talking about? Do we compare foreign workers to the indigenous population or to other groups of immigrants? Further inquiries will most likely find significant differences in the labour market attainments of White natives and White immigrants, as well as White immigrants and Black and Ethnic Minorities migrants, not to mention that even these groups are far from being homogeneous, and regulations of careers of White migrants from the EU and elsewhere differ quite radically. It might be interesting to explore how the notion of skills can be regulated as well, typically in accordance to the current needs of the host labour market. For instance, some years gardeners and hairdressers were referred to as skilled occupations, but once the need for them had been met, the political discourse had changed and they were relegated to the semi-skilled category, diminishing opportunities to migrate for these professionals and presumably affecting their professional identities. Future investigations should also pay more attention to how migrant workers exercise their own agency and how they can stimulate certain changes or adjustments of regulation. We can think of a Kurd community in Germany, who were regarded as an unproblematic part of a much larger Turkish community. Thus, the Kurds were subjects of the national German regulation which restricted their participation in the mainstream economy, but at the same time norms imposed by the Turkish majority limited their chances to secure employment on the ethnic job market. Only after a few years of negotiations the Kurds were granted a status of ethnic minority and were permitted to establish their own media, schools, kindergartens and businesses of that sort. Consequently, many unemployed (or employed in routine and mundane roles) Kurds gained skilled or highly skilled jobs, improved financial well-being and upgraded their social status. We shared these and some other ideas on day two of the seminar in the hope that it would stimulate further discussions and debates needed to expand our understanding of regulation of work and employment and to demonstrate how it can be examined from different perspectives and analysed on multiple levels. The seminar has indicated once again the immense amount of work going in this direction. Yet, much more is needed to advance existing knowledge and we believe future investigations will yield results applicable and valuable for various fields of study, including our own. This entry was posted in ESRC Seminars by Stewart. Bookmark the permalink.